takes the focus off of your bust. 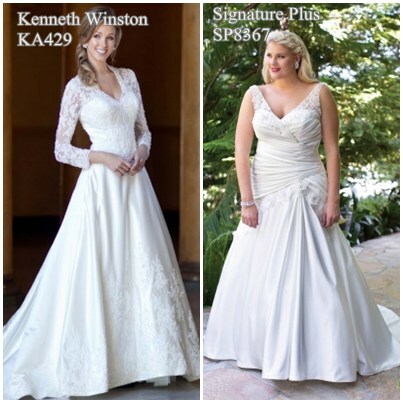 Looking for complimentary style wedding dresses for large bust body type? Now don't assume that since you wear a full cup bra you automatically are in this shaping. You can have a full cup bust size and not have a prominent bust. This happens more so with plus size women. Typically, when you have a prominent bust... the bust circumference is quite a bit larger than the hip area. From your side view the bust sticks out "much further" than the abdomen. Some feel having a prominent bust is an asset. If you feel this way, then you can use the suggestions below that you feel flatters your figure. A lot of the information is here to help you draw some of the attention away from your bust. You will have to pay attention to the neckline depth or choose styles that will still look good if you want to add a modesty piece to the neckline if it is too low. You will need to choose a wedding gown style that will look good with a modesty piece added to it. "Before going to the bridal shop... to look for a wedding dress you need to wear a good supporting bra. If you are plus size or wear a full cup bra, you must buy the right bridal bra for support, one that works with the style of your gown." Strategies: Create width below the waist to balance the upper body. Make sure the bodice section of your dress doesn't have details, that will make your bust become a focal point. Choose dresses that have details around the waist, hips and skirt section of the gown creating another focal point. Off the shoulder necklines can be an asset for those who have narrow shoulders. Halter necklines can look great on some who have a prominent bust. "Bonny style 318 is a v-neckline with a full ball gown skirt. This design is flattering to large busted body types. You can add a modesty piece made of lace like the straps if you want to cover cleavage. Bonny style 1304 is a halter neckline a-line silhouette with side detail. What's nice about this gown is that the asymmetrical ruffles draws the focus of attention away from your bust." "Bonny style 2166 This design has a modesty in place as part of the design with an emphasis on the waist. Bonny style 2595 is a strapless a-line silhouette with side detail. What's nice about this gown is strapless sweet heart neckline covers very well plus the asymmetrical detail all are figure flattering. 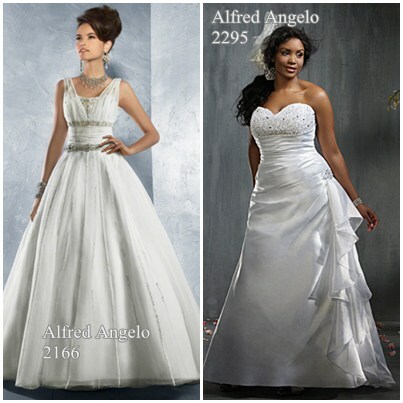 Both are complimentary style wedding dresses for large bust women." "I know you recognize the dress to the left. It's inspiration comes from Kate Middleton's dress. This classic a-line wedding dress with sweetheart neckline style is flattering to everyone. The dress to the right has asymmetrical pleating which is slenderizing and detail at the hips that balance the bustline." High necklines like the jewel and bateau necklines... because they tend to make your bust look larger. Avoid a lot of texture, horizontal pleating or gathering, heavily beaded or heavy lace in the bodice. Avoid a deep plunging front neckline if you are going for a sophisticated elegant look. Most empire waist style wedding gowns focus attention on the bust area, so this style may be one you want to avoid. So when it comes to finding flattering wedding dressess for large bust body types it really depends on how you feel about yourself. If you are happy with yourself then you won't have a problem finding something. The tips above will enhance your body type. If you want a bridal gown to minimize you bust ... in some cases, no matter what you do, you will not look that much smaller. The goal is to minimize the focus on your bust area and to direct attention to your face and overall appearance through details on the dress. If you follow some of the things mentioned above you will find the perfect wedding dress! Best wedding dress styles for inverted triangle body shape. This body type has similar challenges as the large breast body type.